Don’t just grab your winter coats, sunglasses may be needed! 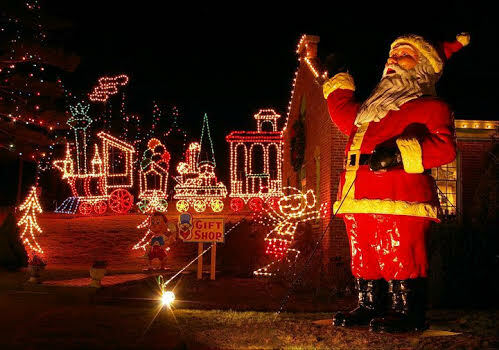 Edaville USA announces the biggest holiday light explosion in its history, over 10 million lights, it just might blind you! Edaville has added 5 new rides along with its newest attraction Thomas Land, including 10 new rides. Edaville USA’s Festival of lights has been a tradition for over 70 years. Generation after generation returns to the park to recreate priceless family memories. Young and old alike enjoy the park from the train ride to the Ferris Wheel, and don’t forget the newest addition Troublesome Trucks. There is something for everyone! Reopening on November 20, 2015, all, rides and attractions are included in general park admission. General admission will be $29, free entrance to guests under the age of 2, and $26 for seniors. Additional events include Santa VIP, for $44 and Polar Express for $47, reservations strongly recommended as seating is limited. Tickets can be purchased online by visiting www.edaville.com or at the park entrance. For more information, exciting offers and updates, find Edaville USA on Facebook, or visit the website at www.edaville.com. This giveaway is sponsored by Edaville USA, all opinions are my own. My son loves Edaville! His favorite is probably the teacups! We laugh until we’re out of breath as we make it spin around as much as we can! Hoping to go with the whole family for a really special treat for the kids! Never been, hoping to take my two year old he would love it! We love the train ride and the grandkids loved the planes and the teacups!! My grand daughter overs the teacups & my grandson love Thomas. I would love to take my grandsons. They have never been and they would just love it I’m sure. we have never been but I am so excited to take my daughter. she will love the caterpillar! I just moved back home to New England and I would love to take my son here!